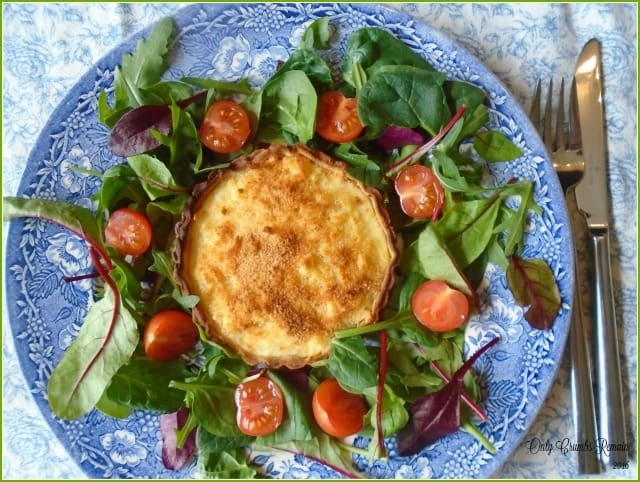 These wonderful vegetarian savoury open cheese tarts, made from Wensleydale cheese, are easy to make with a few store cupboard ingredients. Like Wallace, of the animated duo Wallace & Gromit, I’m somewhat partial to a chunk or two of Wensleydale cheese. A delicious, crumbly white cheese made here in Yorkshire. So, having come across a recipe called ‘Wensleydale Tarts’ in our copy of a book entitled ‘Flavours of….Yorkshire Recipes’ I instantly knew I wanted to try it. The British Cheese Board tells us that Wensleydale cheese has been made in Wensleydale (located to the north east of England in Yorkshire) since 1150. French Cistercian monks brought with them their method for cheese making when they settled in the dale and built a monastery. Over the years this technique and skill was passed from monk to monk and onto farmer’s wives, so when Henry VIII dissolved the monasteries in 1540 that cheese making process wasn’t lost. 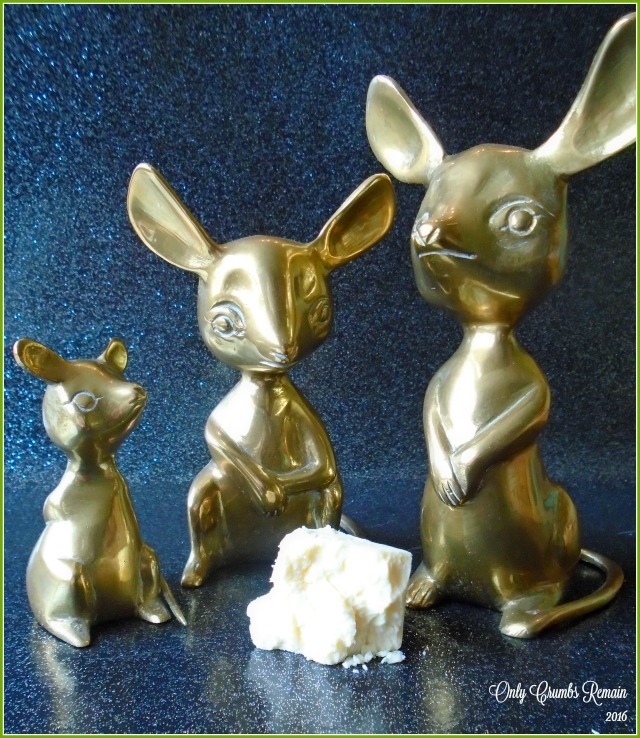 Due to the threat of centralisation in the dairy industry and the outbreak of the second world war the indigenous production of this wonderful cheese was threatened. It is through the hard work and determination of local folk in the dales that this historic cheese has survived and has been awarded the Protected Geographical Indication (PGI) mark. The tart itself is easy to make, and can be made ahead of time before being finished off when you’re ready to serve. The pastry case is made from a simple short crust pastry. It’s a straightforward pastry to make, though, if you prefer, it would be equally as tasty made with a shop bought pastry. The pastry is baked blind until it is cooked through before being filled with a thick white sauce which is flavoured with nutmeg, onions and a generous quantity of Wensleydale cheese. 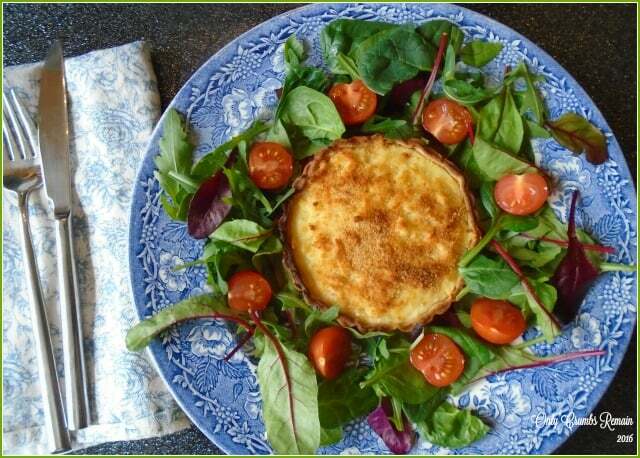 Once the tart case is filled with the flavoursome sauce, it is topped with more cheese and breadcrumbs before being popped under the grill for a few short minutes until golden brown. The tart can be made any size you fancy. Small individual patty sized ones would be great packaged up and taken on a family picnic though a larger one would be lovely sliced into portions. Mr E & I chose to make individual tarts in our 12cm (diameter) tins which we find to be a nice size when served as a main meal. The quantity outlined in the recipe below is sufficient to make 3 x 12cm tarts. The recipe I am sharing here is pretty similar to that outlined in the ‘Yorkshire Recipes’ book, although I adjusted the sauce a little by adding a further 50ml of milk as I found their quantities resulted in something overly thick. This said, you’re not aiming for a pouring sauce as the mixture still needs to be quite thick to allow it to sit nicely in the pastry case. The crunchy texture of the toasted breadcrumb topping contrasted beautifully against the smooth creamy nature of the white sauce. The tart was incredibly flavoursome and when I posed the acid test question of “would you have this again” to Mr E his response was an eager nod of the head whilst consuming another mouthful of the tart. The third tart was offered to a dear elderly neighbour of ours, David, who also thoroughly enjoyed it describing it as ‘first class’! 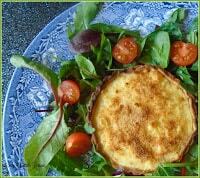 Mr E & I served our individual Wensleydale tarts with a simple green salad and new potatoes which was thoroughly enjoyed. Time: 30 minutes hands on; about 20 – 25 minutes bake and grilling time; plus resting time. Adapted from: ‘Flavours of….Yorkshire Recipes’, Wensleydale Tart. 1. Make the pastry. Place the flour, salt and cubed chilled butter into a good sized bowl. Rub the butter into the flour between your thumb and finger tips until the mixture resembles breadcrumbs. Make a well in the centre of the breadcrumbs and add 1 tablespoon of cold water. Using a rounded pallet knife, or similar, cut through the mixture to make a dough. Add a little more cold water a teaspoon at a time to fully bring the mixture together. Shape the pastry into a ball and flatten into a disc. Wrap in cling film and place into the fridge for 30 minutes to rest and chill. 2. Line the tart tins. Remove the pastry from the fridge and unwrap. Cut the pastry into 3 equal pieces. Place one piece onto a lightly floured work surface. Flour the rolling pin. Roll the pastry out until it is nice and thin, about 2 – 3mm. Wrap the pastry around the rolling pin and carefully place it over one of the tins and gently lay it inside. Use the pad of your thumb and fingers to ensure it sits in the tin well. Avoid stretching the pastry. Use a pair of scissors to cut off some of the excess pastry. Repeat with the other tart tins. 3. Set aside to rest. Place the lined tins into the fridge for 20 minutes to rest. 4. Meanwhile pre-heat the oven to 200c / 180 fan / Gas 6. Place a baking tray into the centre of the oven large enough to hold your flan tins. 5. Prepare to blind bake. Remove the chilled pastry cases from the fridge. Use a paring knife to trim the excess pastry from the flan tins. Cut 3 pieces of greaseproof paper large enough to fully line the pastry case. Scrunch the paper and open it back out. Lay the paper carefully inside the pastry case. Pour in some baking beans or uncooked rice to hold down the paper, encouraging the paper into the edge of the pastry case. 6. Blind bake. Place the flan tins onto the heated tray in the oven and bake for 15- 20 minutes until the pastry is fully cooked. You may need to rotate the flan cases half way through the bake. Once cooked through, remove from the oven and place onto a cooling tray. 7. Make the filling. Melt 25g of the butter in a frying pan. Add the prepared onion and gently cook over a low to medium heat until it is soft and transparent, moving the onion around periodically. Avoid browning the onion. Place the second 25g butter portion into a pan and set over a medium heat to melt. Tip in the nutmeg and flour. Use the wooden spoon to stir the flour into the butter to make a thick smooth paste. Slowly add the milk to the paste, stirring all of the time allowing the milk to fully combine with the paste before adding more. Once all of the milk has been incorporated allow the sauce to cook for a few minutes on a low heat, stirring all of the time. Add the onions and 60g of the cheese. Stir until it has melted. Season and stir again. Take off the hob heat. 8. Assemble the tart. Divide the cheese sauce between the pastry cases. Level it out with the back of a teaspoon. Top each of the tarts with the remaining grated cheese. Sprinkle over some breadcrumbs. 9. Grill. Place the tarts under a moderate grill for 3 or 4 minutes until the cheese has mostly melted and the top is golden brown. You may need to rotate the tarts partway through the process, taking care not to burn the pastry edges. a) If you’re unable to get hold of Wensleydale cheese, your could consider replacing it with a mild white crumbly cheese. b) Shop bought pastry will work equally as well as homemade pastry. c) If your sauce goes a little lumpy when adding the milk, take it off the heat and beat thoroughly with the wooden spoon. Once smooth again, return to the heat and continue with the recipe. d) If making ahead of time, stop at the end of step 7. When ready to assemble give the sauce a thorough mix before filling the tart case. e) The original recipe tells us that the Wensleydale tarts should be eaten warm rather than piping hot. These looks delicious. Thanks for sharing. Have a wonderful weekend. This sounds wonderful. I'd completely forgotten about making tarts with cheese sauce until I saw one recently. i must get onto it and also try using Wensleydale rather than cheddar for a change. Aw thank you Choclette, Ooh you must try one with Wensleydale it so flavorsome and yet more mellow than a cheddar. You, me, Wallace and Gromit would have a wonderful lunch with these tarts. I too love a bit of Wensleydale. I think these would be ideal for a light lunch as you've served them with salad. Pinning for a later date as I'd like to lunch on these. I'm sure you'll soon get to grips with the pastry Charlotte, try not to over work it. It was great to make the component parts of these ahead of time and then finish them off when we were ready to eat. I grew up in Yorkshire and we always had Wensleydale in the fridge. I really love it to eat by itself or to crumble into a salad but I haven't ever made a tart with it. I know I'd love it though. Sounds lovely! Aw thank you Alison 🙂 The mice were actually a gift from my aunty who was clearing out a few bits & pieces. Aw thank you Sarah 🙂 I can imagine, Mr E & I could never turn vegan for that very reason, though I must admit we've never tried vegan cheese (though from your comment it sounds like we're not missing anything). Gosh these look incredible! I love the small portion with a salad. Looks positively delicious and healthy at the same time! This looks so freaking delicious ! I looooove Wenslydale, especially the ones that come with cranberries or apricots in! Mmmm darn it now I'm going to go and eat cheese and crackers. Also I love your new blog design ! (sorry I'm behind the times I've been away for 5 months) It looks cracking! Welcome back Betty, trust you had a fabulous time. Yay a fellow Wensleydale cheese lover 🙂 Though I must admit I prefer my cheese without any added flavours like the cranberries and apricots – I know, I'm fussy! Nooo, how can you not like Wensleydale cheese Eb 😉 Mr E prefers full bodied cheese too, like he says you only need a small piece of mature cheese for the flavour to come through (which of course is better in terms of fats etc). David, who happily ate the third tart, is also fan of big flavours too yet he made a special point of saying how much he enjoyed this tart even though it's made with Wensleydale. I think the added onion and nutmeg certainly helps. They really were delicious! I'd love to hear how you get on with them if you give them a whirl.